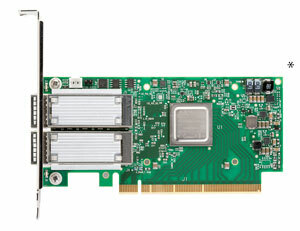 Intelligent ConnectX-6 adapter cards, the newest additions to the Mellanox Smart Interconnect suite and supporting Co-Design and In-Network Compute, introduce new acceleration engines for maximizing High Performance, Machine Learning, Web 2.0, Cloud, Data Analytics and Storage platforms. ConnectX-6 with Virtual Protocol Interconnect® supports two ports of 200Gb/s InfiniBand and Ethernet connectivity, sub-600 nanosecond latency, and 200 million messages per second, providing the highest performance and most flexible solution for the most demanding applications and markets. ConnectX-6 VPI delivers the highest throughput and message rate in the industry. As the first adapter to deliver 200Gb/s HDR InfiniBand, 100Gb/s HDR100 InfiniBand and 200Gb/s Ethernet speeds, ConnectX-6 VPI is the perfect product to lead HPC data centers toward Exascale levels of performance and scalability. *For illustration only. Actual product may vary.